Thanks to Elana and Jacquie at Beauty Chat Blog for the fabulous review of our Purely Clear skin care line. As I get older, I notice more and more that I need to have a daily routine to keep my skin looking healthy, clean and wrinkle free. I prefer the organic, natural products. There are enough pollutants in the air, so why add more with your toner or moisturizer? Purely Clear offers a line that works for all skin types. I don’t get too many blemishes a just a few here and there. I do have blackheads, a bad T-Zone, and very dry cheeks. This combo makes it difficult to finding products that will not send my pores into overload. Purely Clear is different; it cleans without over drying or leaving an oily feeling. The toner is a blend of oils that don’t dry out your skin and the Intensive Repair and Wrinkle Serum help to balance and moisturize. To me, this product is a miracle worker. You feel the difference in minutes, not days or weeks. My skin is more balanced, not dry or greasy. The formulas are concentrated, so a little goes a long way and the small bottles last for months. I suggest that everyone check out the Web site and give it a try. I have passed Purely Clear along to my mom and sister and they love it. Hair by Angie will debut Purely Clear Mineral Makeup at a Christmas Extravaganza on December 6, 6836 Maynardville Highway, Knoxville, Tennessee 37918. There will be free makeup applications offered by professional makeup artists. Refreshments will be served and a drawing for a Holiday Gift Set of Purely Clear Mineral Makeup valued at $90 will be given away. Phone 865-237-9571 to schedule an appointment for makeup application. Hair by Angie would like to thank the Health Shoppe for hosting this event. Want To Try Purely Clear’s Mineral Makeup For Free? 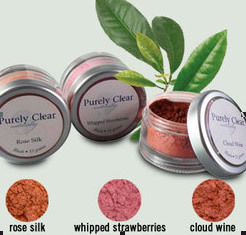 Tell prettybycritty.com what you’re thankful for this holiday season and you will be registered to win the Holiday Special Gift Set of Purely Clear’s Mineral Makeup. This set includes a pony pump foundation, blush or bronzer, eye shadow, and lip colour of your choice and retails for $90. Good luck all you pretties. Purely Clear has expanded our line of products to include eye shadow, foundations, blushes, bronzers, concealers, lipsticks, and setting powder. These items, as well as the increasingly popular skin care line are available online. Knoxville’s WBIR-TV dropped by recently to interview us about the Purely Clear line of 100% natural products. If you missed the story, or live outside our area, take a moment now to see the interview. What a great day it was at the Farmers Market in downtown Knoxville. The weather cooperated, but the “only one step required for assembly” tent was missing at least seven steps. In the end all worked out for the good. The vendors were very kind and helpful and I was quite impressed with their works. I picked up several items and can’t wait to return for more pumpkin bread – best I’ve ever had. I sincerely appreciate the tweeters who stopped by to say hello. Thanks for all the positive comments on the booth. I will be at the Farmers Market again this Wednesday, September 24. If you’re in the area stop by and say hello. My thanks to Christie Ingram at www.prettybycritty.com for hosting a contest on her site for the Purely Clear Cleansing Concentrate and Purifier/Toner/Nourisher. I do appreciate all the entries and positive comments about our natural skin care line. Christie, I hope you and the contest winner enjoy your Purely Clear products.